These are supreme almonds coated lightly with a thin pastel sugar shell. They're a delicious treat all year long. Price quoted is per pound, not including shipping. 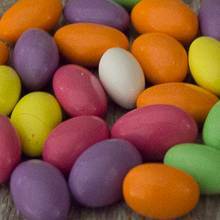 Ingredients: Sugar, almonds, tapioca dextrin, artificial colors (yellow 5 lake, yellow 6 lake, red 40 lake, blue 1 lake, blue 2 lake), color added (titanium dioxide, carmine), corn syrup, carnauba wax, natural flavor, confectioner's glaze.